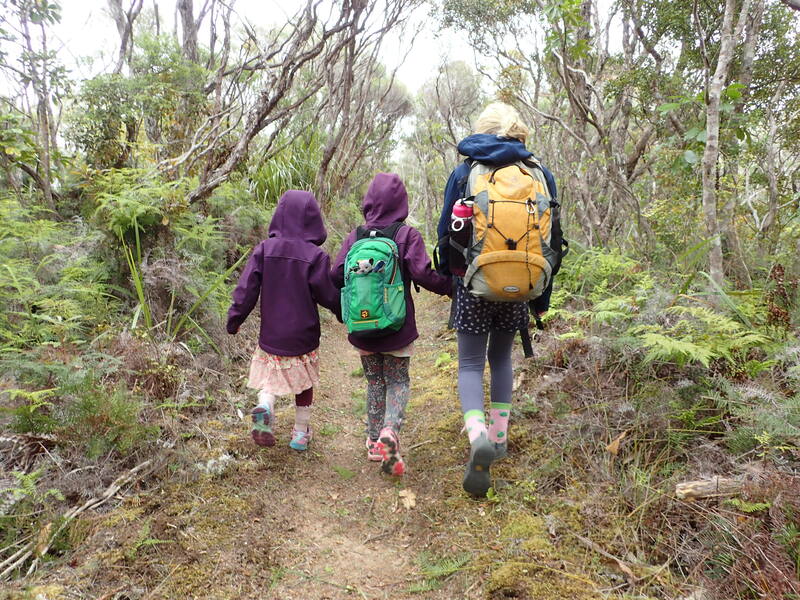 We’ve just got back from a wonderful two day family hike through the beautiful forest covered mountain ranges on Great Barrier Island. The girls were all super excited whilst planning this adventure and extremely proud of their efforts upon return to our floating home. It’s very exciting for us parents to be able to enjoy physical activities with our children where we all feel tired at the end of the day. 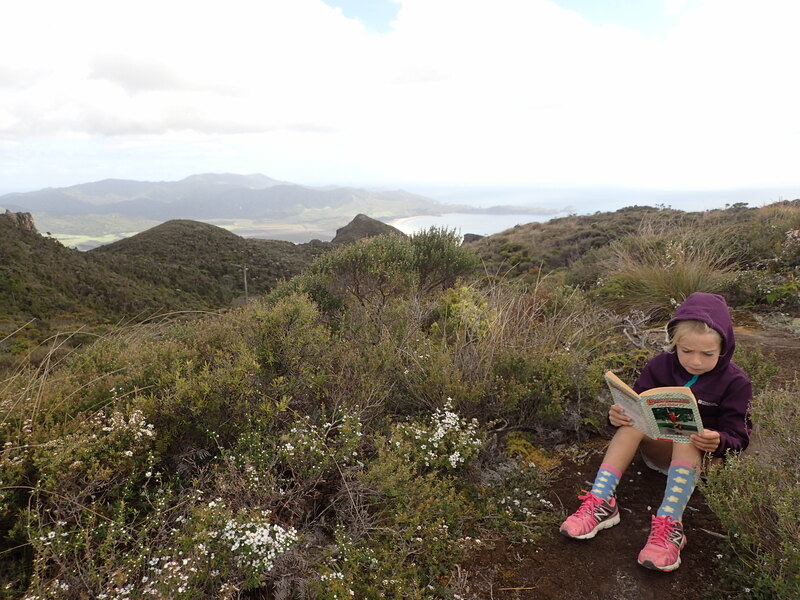 On day one we had an elevation gain of 350m and covered 4km before descending 100m to a beautiful hikers hut with spectacular views over the mountains to islands in the Hauraki Gulf. On day two we trekked for 8km, descending 550m back to Tangaroa at sea level. Over the years we have managed to go on a few overnight family adventures, sometimes on our bikes, sometimes walking and often carrying the littlest family member, whether in a sling, a backpack or a bike seat. This latest adventure represents an important milestone for us, with every one of us doing the activity under our own steam and, most importantly, reaching the end feeling happy and prepared to take on a similar challenge in the future. “Can’t walk” is a frequently heard phrase from little 6 year old Beatrix. We know that it’s a “won’t” rather than “can’t” so we try all we can to pursuade her to continue. Anyone who knows Beatrix knows stubborness and if she decides that she won’t walk, she won’t walk. We can continue walking and no distance is too far away to make her get up off the ground and walk towards us, she will just cry louder. We can bribe her with her favourite snack in just 10 more steps but even this will not encourage her to move her legs! 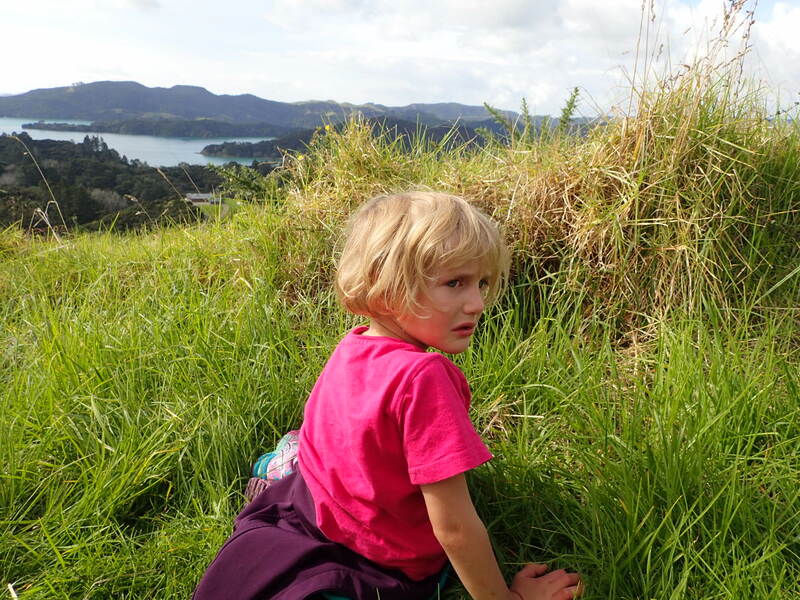 We’ve learnt a few tricks to hiking with kids over the years which starts with not calling it a walk or hike, instead we go on adventures or go exploring. We try and generate a bit of excitement over the pending activty in an attempt to avoid the “can’t walk” mentality. For this latest overnight hike we managed to do this a bit too well and Beatrix woke up two hours early, pestering us to leave immediatley! I think a big component of enjoying any activity is feeling like you have a certain level of control. We give the kids a little bag of treats that they can eat when they choose and if they insist on carrying a little friend with them we allow it, even though we know that we will end up carrying it. When you are the smallest, least fit or least experienced it is easy to feel overwhelmed and concerned that the you won’t be capable. There’s nothing worse than feeling like you need a break but have to keep pressing on to keep up or when the rest of the group have a nice long rest while you barely manage to catch your breath before the group eagerly continues. 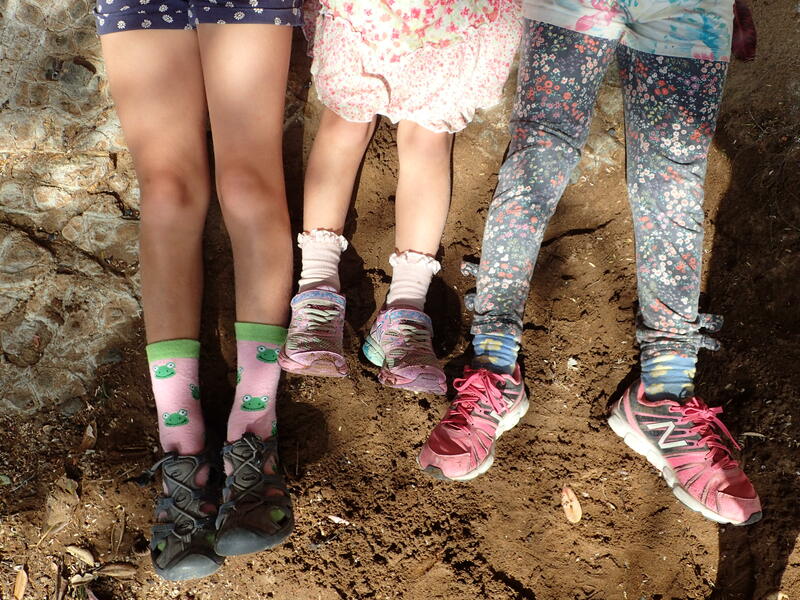 I have found that when we are doing more enduring activites with the girls we get a lot more effort out of them when we empathise with their tiredness and tell them how hard we’re finding it too instead of when we try a more direct approach along the lines of “Come on you can do it”. Keeping positive and making the activity exciting can be a challenge, but far less of a challenge than having a child lying in the middle of the track refusing to go any further! When we see the tiredness setting in we use the power of distraction and often recite entire story books such as “The Gruffalo” (Julia Donaldson) and “We’re going on a bear hunt” (Michael Rosen). We now have the ultimate distraction tool in the form of two older sisters, who themselves enjoy hiking and love a good long role playing game that takes on various different names but essentially is a game in which the three of them are out on their own looking after each other. The only involvement we have in this game is when we enter the forbidden 10m radius and are promptly ordered to go away. Distracted, happy, walking kids and a bit of peace for us, bonus! The other game that keeps the metres trailing away under their feet is where they pretend that their toys have left kisses in the trees that give energy when they retrieve them from the hiding places. Some days the stars align and all family members are happy, other days the activity can be more enduring. Either way we try our best to keep everyone feeling positive and when this is getting tricky we just have another snack break! 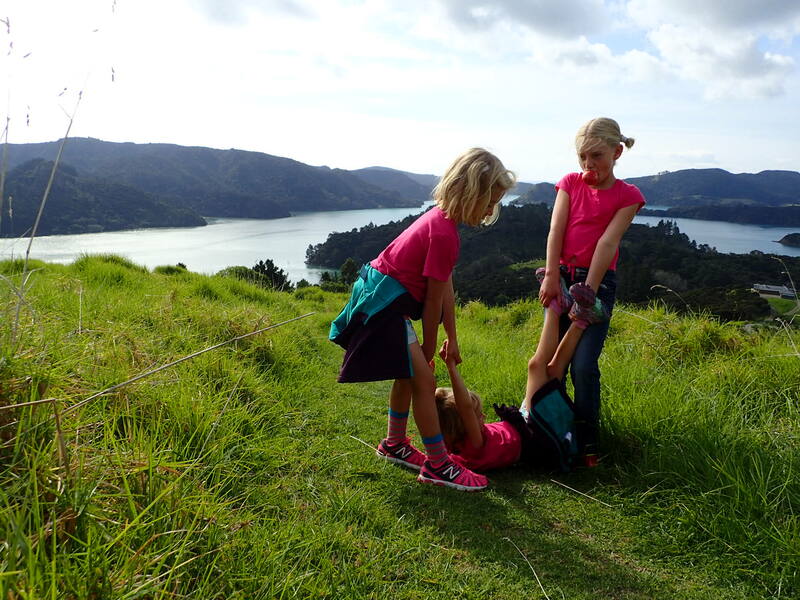 So with tired muscles and happy faces all round I will end with a few photos of the very enjoyable overnight tramping adventure that we experienced on Great Berrier Island, New Zealand. So. Fun!! And I really needed to read this as my youngest refuses to hike and I needed some new strategies! Ha, love it. I am actually a little bit surprised that you, after eight month living on a boat, are still able to walk more than a km, I thought your legs have slowly metamorphed into fins . I completely agree with your statement “Do not call it a walk, call it an adventure”. We do “parcour” whenever Max decides he gets tired, which means we all just start running and jump over logs, from rock to rock and do all kind of silly tricks. Last month we did the two day Major Mitchell hike and it was such a great weekend. Yes, I’m surprised that our legs still work for walking! I think we must be constantly using our muscles without realising it due to the constant motion of the boat. That hike sounds awesome. Max is a machine, he’s so strong and determined.